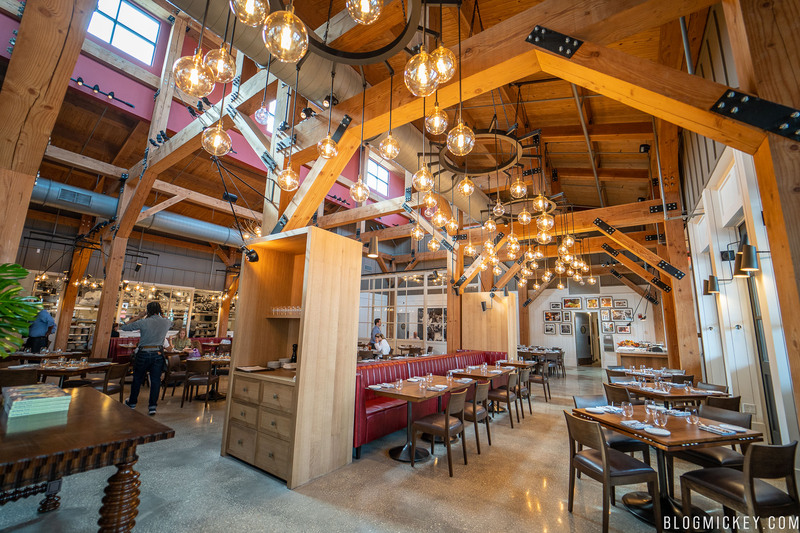 The all-new Wolfgang Puck Bar and Grill has opened at Disney Springs. Situated between the Coca-Cola store and across from Chicken Guy, Wolfgang Puck isn’t new to the Disney scene, but the location is. 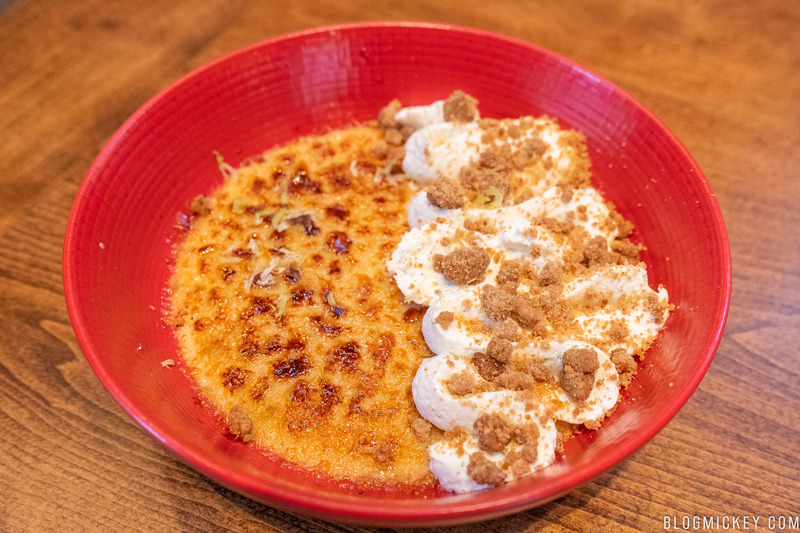 We visited on opening day to give the menu a try and see how it stacks up to the many other offerings at Disney Springs. 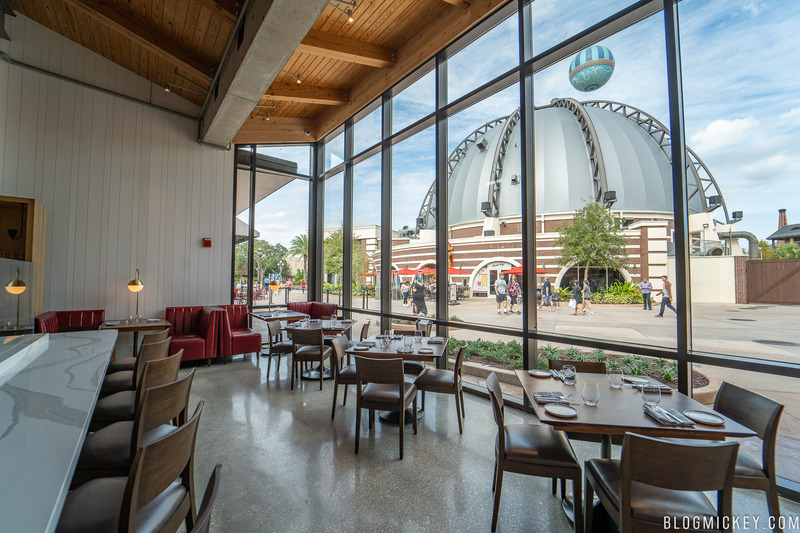 With so many locales at Disney Springs having a backstory to try and justify their existence in the lore, Wolfgang Puck Bar and Grill doesn’t have any obvious tie-ins. The space is open and natural light flows throughout. 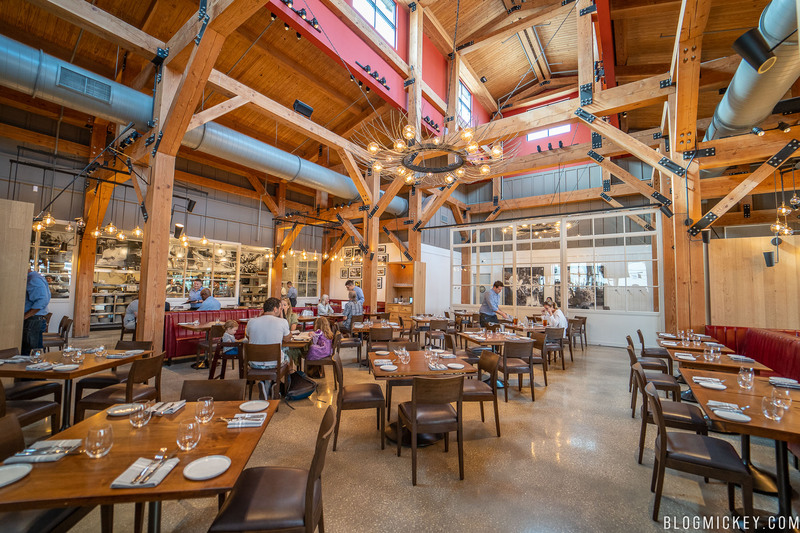 A large window demands your attention from the outside of the restaurant, but windows in the ceiling allow most of the dining areas to enjoy a good amount of light during the day. When it was announced, we were excited for a fresh take on an existing celebrity-chef offering. 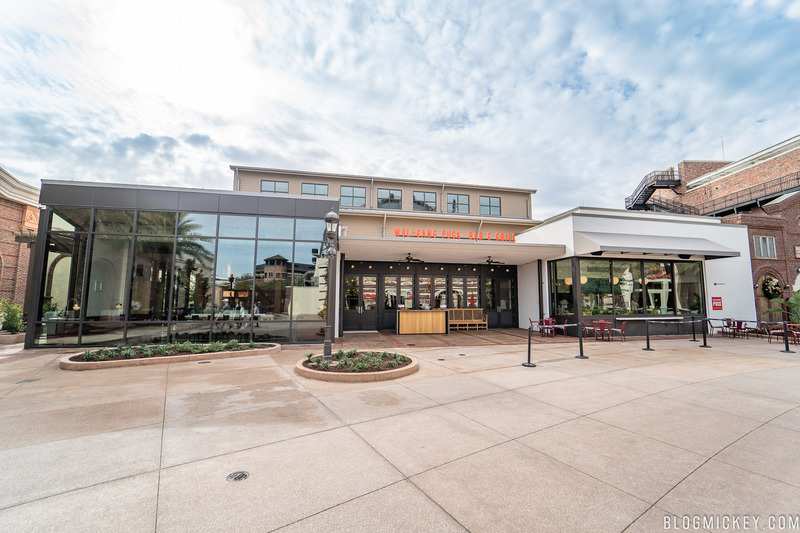 Generally speaking, we’ve been very impressed with the celebrity-chef offerings already at Disney Springs such as Frontera Cocina, Homecomin’, Morimoto Asia, and even Chicken Guy. 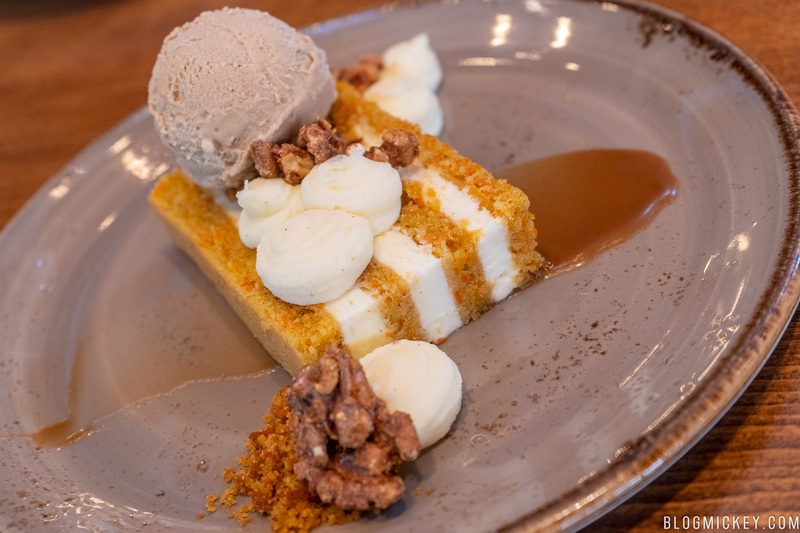 If you only have the chance to dine at Disney Springs once or twice on your upcoming vacation, we highly recommend a celebrity-chef location. 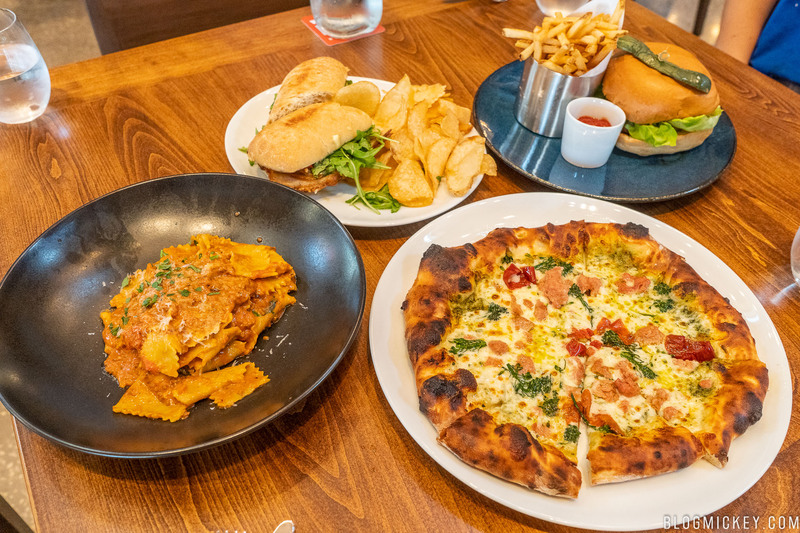 The menu here at Wolfgang Puck Bar and Grill features some very approachable items that would suit the whole family. From pizza, to burgers, pasta to steak, there are some real winners on the menu that we can’t wait to get back to enjoy. Here are our thoughts. We’ll start at the beginning, with appetizers! We start our review with the Artisanal Salumi. With the rise in popularity of cheese boards, it was nice to see a charcuterie with a good selection of meats. We had three different variations of salumi as well as two types of cheese. Marinated vegetables also come out with the board, and as we found out almost too late, you ignore them at your own demise. Let’s start with the meats. Wolfgang Puck has made a conscious effort to source as much of his ingredients as possible from local farms. While there are still some necessary imports, everything that we had throughout the meal was noticeably fresh. 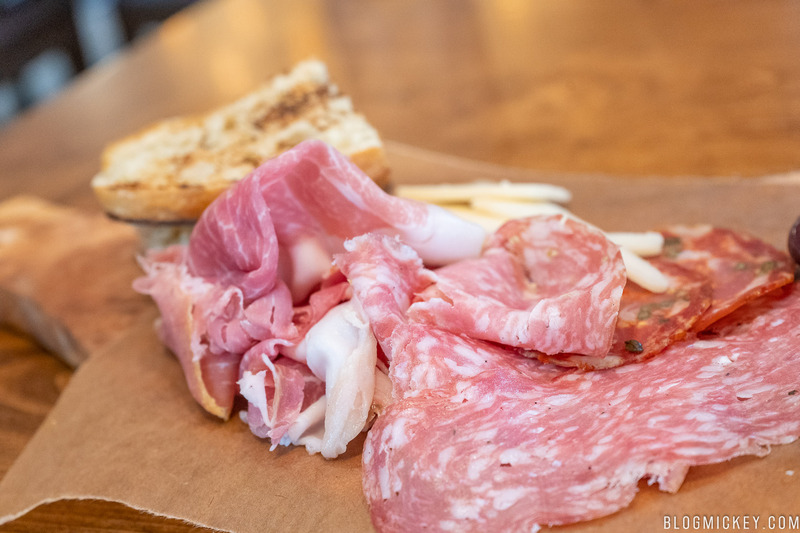 The meats ranged in flavor from almost a sandwich salumi to a salumi with a kick. The most benign of the bunch was the prosciutto (pictured above). It was soft, easily tearable, and sliced thin. It makes a nice topper for your toast and pairs well with everything. Next up was the soppressata. It was the spiciest of the trio, and paired well with the lamb cheese as a yin and yang. Because my photos (and knowledge of salumi) are limited of the third meat offered, I’m not going to try and name it, but rather let you know that it only suggested a hint of spiciness to it, and ended up closer to the prosciutto than the soppressata. The Artisanal Salumi also came with two cheeses. One was a hard cheese that crumbled quite easily, and the other was a spread. Both were quite nice, but we enjoyed the firmer cheese more. Also pictured below are the marinated vegetables. We largely ignored these because the meats and cheeses were good on their own, but I highly recommend you integrate them into at least a few bites. Overall, you’re getting a good selection of meats for $19. We had the “small” portion and found it was probably a good portion for two people if you planned on getting an entree as well. A “large” portion is available for $29. 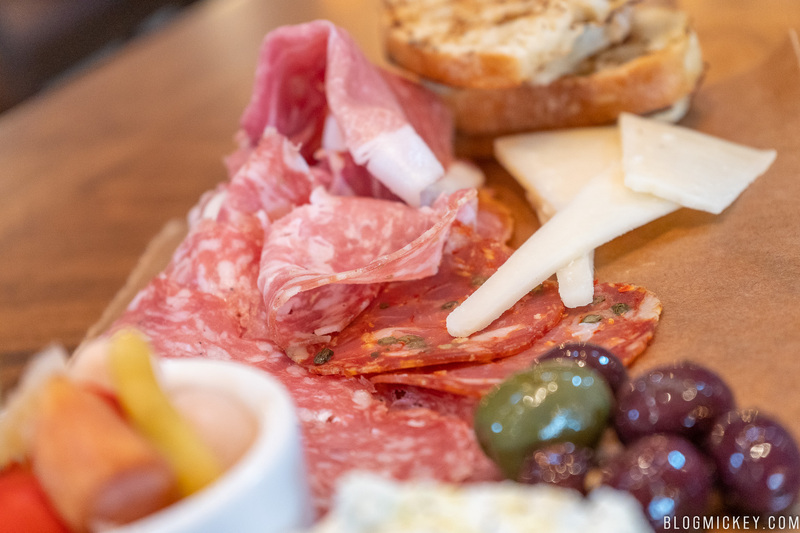 We can definitely recommend the Artisanal Salumi, but keep reading for an even better appetizer option. 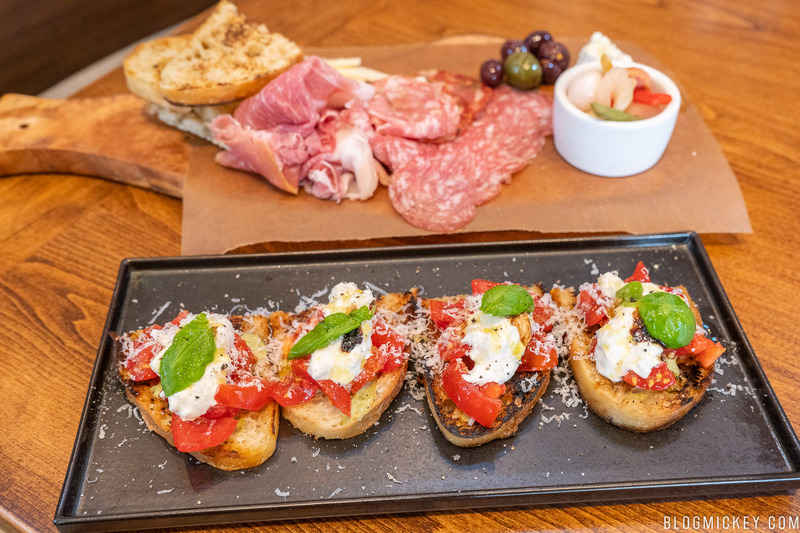 The second appetizer we ordered was the bruschetta. 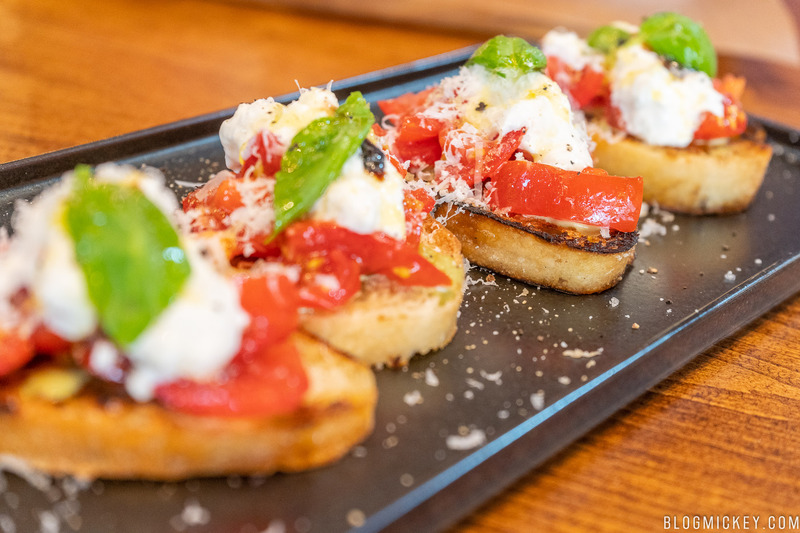 Keeping with the theme of noticeably fresh flavors, we find marinated tomatoes, torn mozzarella, pesto aioli, and aged balsamic all sitting atop a hard, toasted bread. Each bite was amazing. The aged balsamic permeated each topping, providing a wonderful flavor throughout. Wolfgang Puck smartly utilized the same technique from the Artisanal Salumi here with the tomatoes. It all came together with a wonderful helping of mozzarella on top. Would I liked to have seen five helpings for my $12, sure. 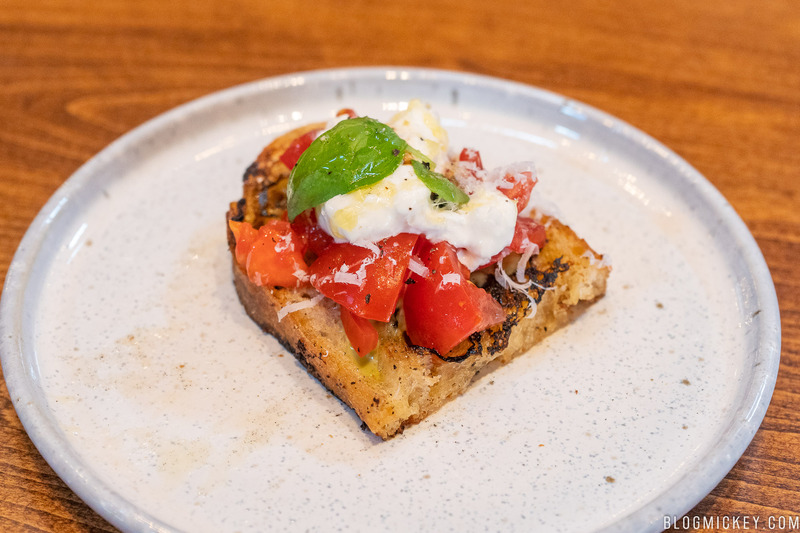 But you really can’t go wrong here and we’ll definitely be making a return trip to Wolfgang Puck Bar and Grill for the bruschetta. That wraps up the appetizer portion of our meal. On to the entrees! We’ll start with the brick-oven pizza. While it may have been a safer play to go for the pepperoni, we can’t imagine anyone would find value in a $20 pepperoni. We made a good choice. 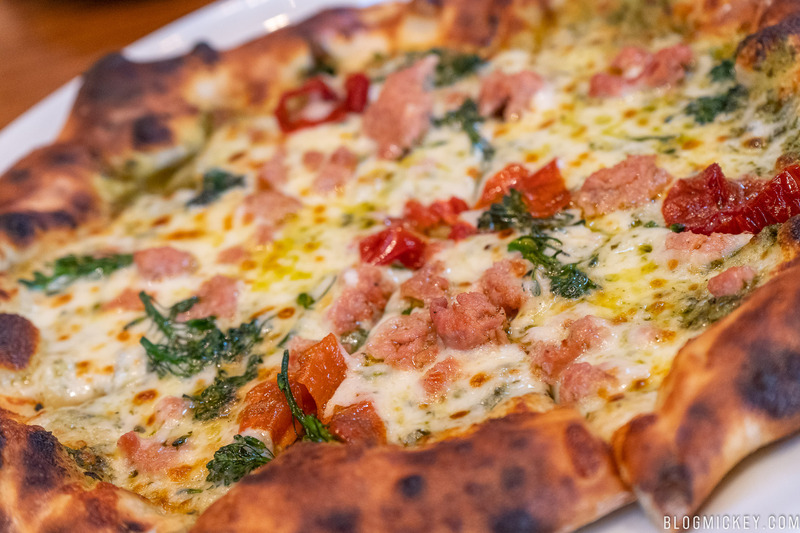 The fennel sausage comes with pickled peppers, rapini, and basil pesto. The pizza was really good. 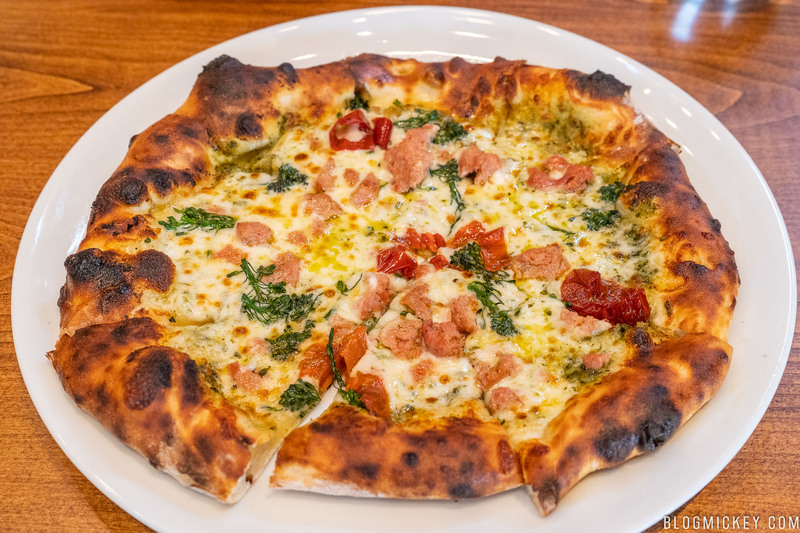 A perfect cook to the crust allowed some brick-oven taste to loiter with every bite. The basil pesto was portioned really well and drove the overall flavor of the pizza. The pickled peppers and fennel sausage attempted to add some spice to the pizza, which the basil and rapini balanced it well. Regarding portion size, this pizza can easily be shared between two people which is what we will be doing when we return. As we were seated, a manager was walking around with a full wild mushroom pizza, offering a slice to guests on the house. We’re glad we took her up on the offer. 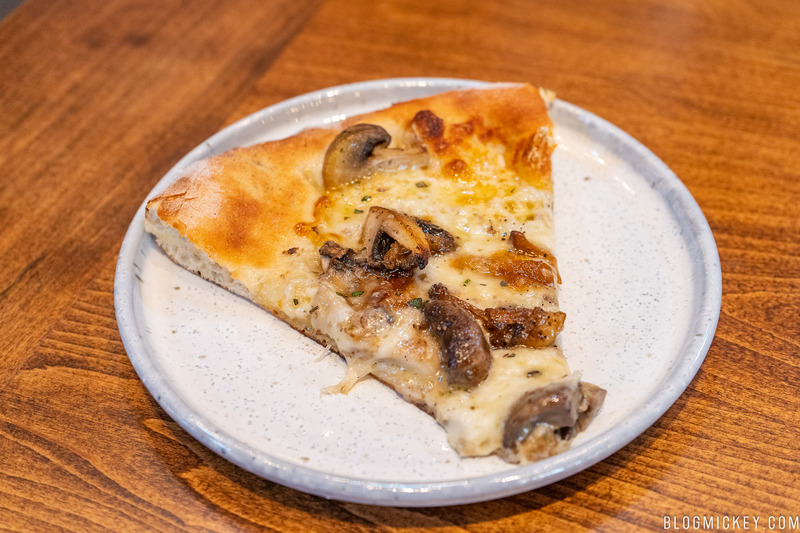 The wild mushroom was another well executed pizza. With fontina cheese, roasted garlic, and marjoram joining the mushroom, there was an explosion of flavors that all worked really well. I’m glad we didn’t have to choose between the wild mushroom and the fennel sausage because both were really good. A whole wild mushroom pizza costs $16. Next up was a robust pasta dish. 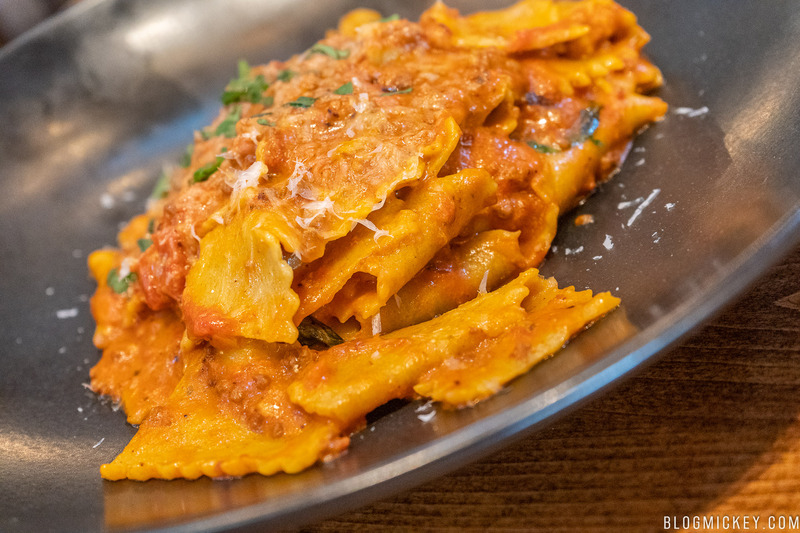 In-house pappardelle pasta is joined by a bolognese meat sauce and a ricotta salata. What appeared to be a small portion for $21 actually ended up filling us up. Layers of pappardelle sit beneath a hearty portion of bolognese meat sauce. The key to this dish is the locally sourced ingredients for the pasta and the fact that they’re able to make it in-house. 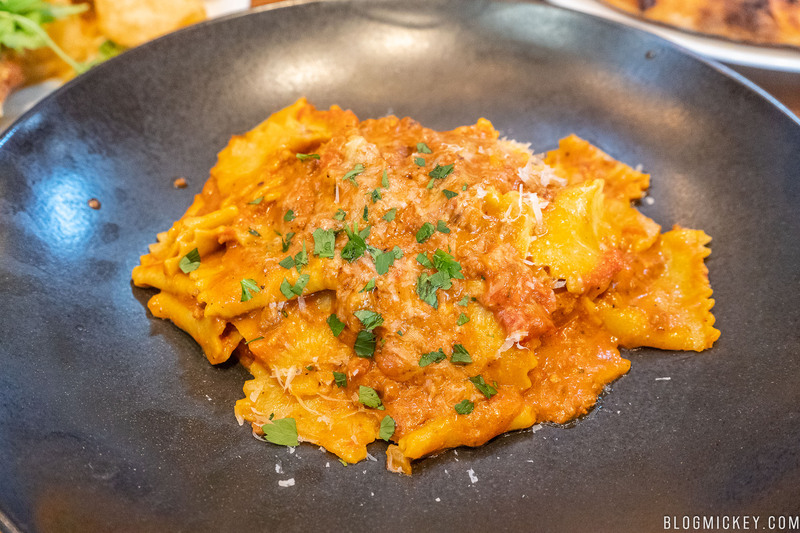 While Wolfgang Puck Bar and Grill isn’t the in-your-face italian place like a Maria and Enzos, I much preferred the pasta here than what was offered by just about any “italian” eatery at Disney Springs. Here’s an item off of the lunch-only sandwich list. 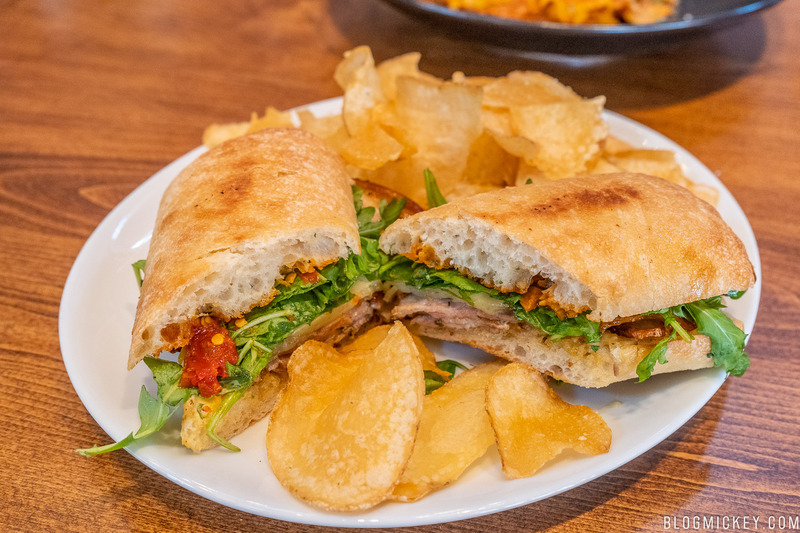 The porchetta is accompanied by a pickled pepper relish, garlic aioli, and arugula, arranged on a toasted ciabatta. 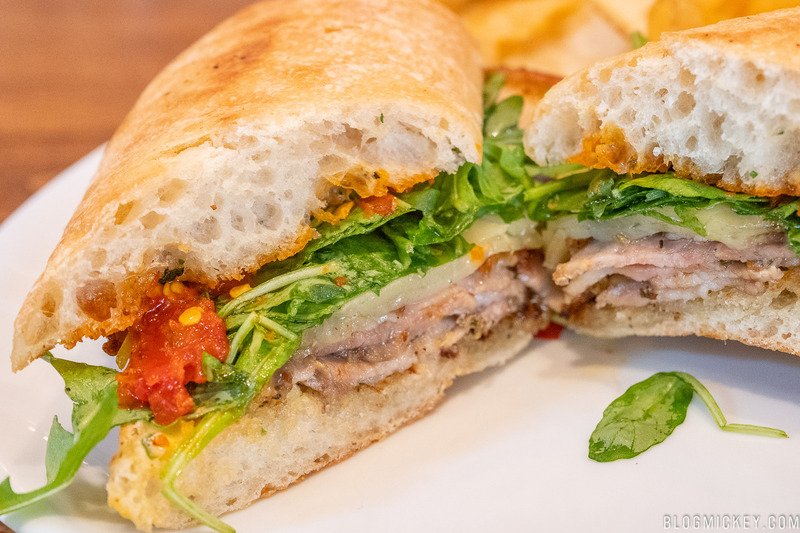 It may be true to say that the star of the sandwich is the pickled pepper relish/garlic aioli combo, but that would overlook the care put into creating an authentic porchetta. You’re not getting a porchetta that was thrown together that day or even that week. The process for creating the perfect flavor for the porchetta starts a month out and it is then slow-cooked for a day to create a crunch on the perimeter of the meat. Of the dishes that we tried, this was our second favorite, leaping past an already good pizza and pasta. We’ve saved our favorite entree for last. The WP burger presents a beef/pork combo patty that retains a perfect flavoring while remaining juicy. Along with the patty, you’ll find white cheddar cheese, red onion marmalade, and garlic aioli sandwiched between a brioche bun. Everything works in tandem here, but the red onion marmalade sticks out above the rest. 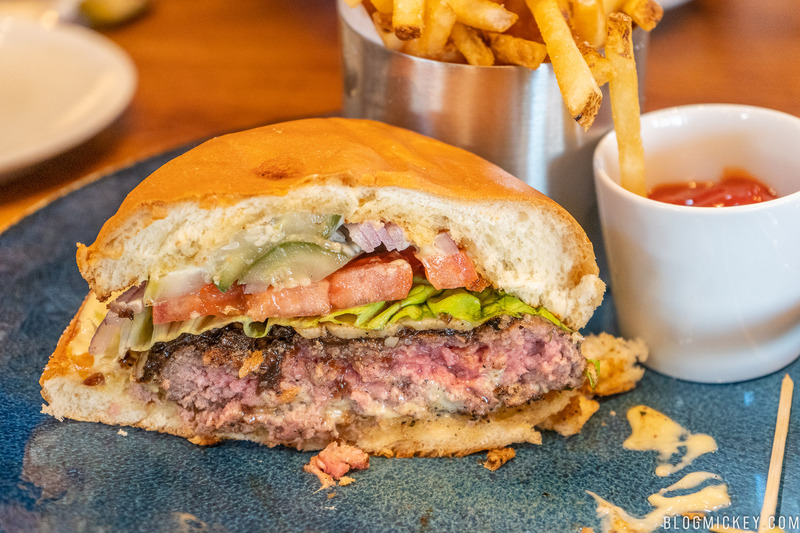 Out of all of the burgers that we’ve tried at Disney Springs, this tops the list, and we can definitely recommend this for a lunchtime visit to Wolfgang Puck Bar and Grill. With entrees behind us now, it’s time to shift our attention to the dessert menu. While we saved the best entree for last, we’re going to start the dessert review with our favorite – the carrot cake. 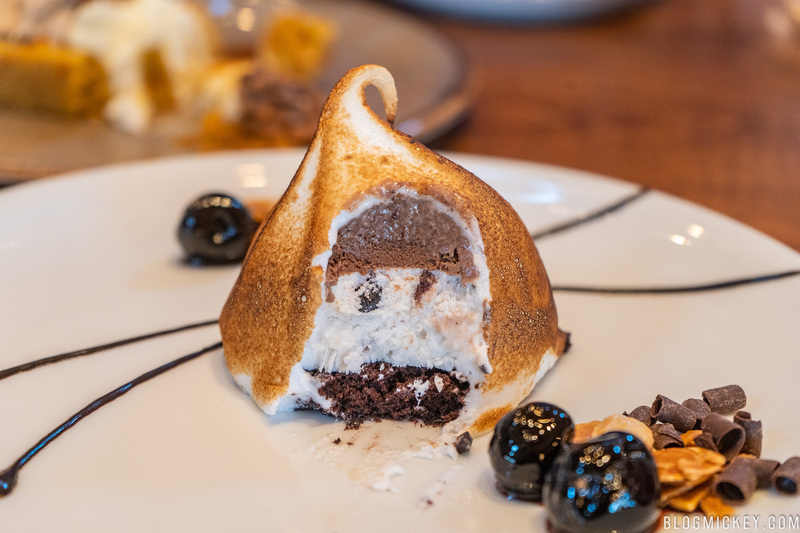 It comes with whipped cream cheese, candied walnuts, and gelato. The carrot cake shines because of the combination of the cream cheese and handmade cake. It’s a light, airy sponge combined with a thick cream cheese for a wonderful combination. Out of the three waiters that we talked to about dessert, the carrot cake was the common denominator as a favorite; and for good reason! With their own dedicated gelato bar, we had to try some of the flavors and a the gelato tasting seemed like the right way to do it. You’ll get three (conservative) scoops of gelato and two cookies. While the cookies weren’t very memorable, the flavoring on the gelato did seem to get it right. We tried, in order from our favorite to least favorite: white chocolate raspberry, chocolate cookie crunch, and butter pecan panna cotta. 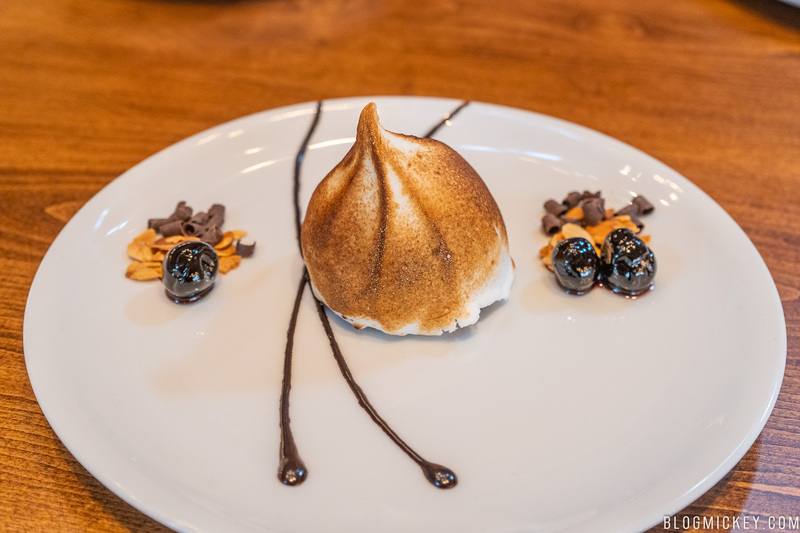 A far cry from the towering baked alaska at The Boathouse, a more petite version is offered at Wolfgang Puck Bar and Grill. 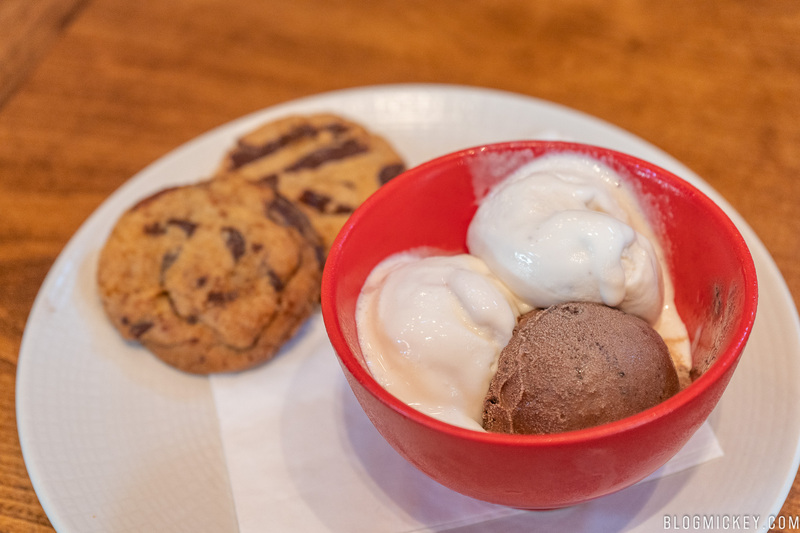 This beautifully presented dessert comes loaded with flavors, but the theme definitely stems from the cherry chocolate chunk gelato. Rounding out our dining review is the creme brulee. It continues the trend of nicely presented desserts and has all of the traditional characteristics of a creme brulee. A key lime pie flavoring is joined by graham cracker crumbles. It’s worth noting its size too. We were very surprised at the large portion that was served and found it to be a great value for $9. 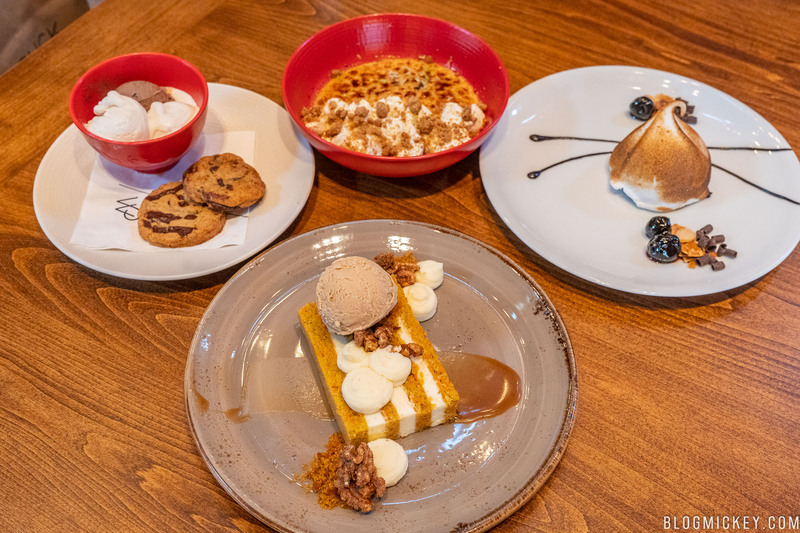 Overall, we didn’t think Disney Springs needed yet another restaurant, but Wolfgang Puck Bar and Grill does just about everything right, justifying its position in the lineup. I’ll circle back on what I said earlier – if you only have one or two restaurant visits penciled into your next vacation, make sure it’s a celebrity-chef locale. They do it right. Frontera Cocina serves traditional mexican food and does it extraordinarily well. Morimoto Asia delivers a wonderful variety of Asian food and executes it consistently. Homecomin’ is a great spot to get some southern food and Chicken Guy offers excellent value for their chicken sandwiches. 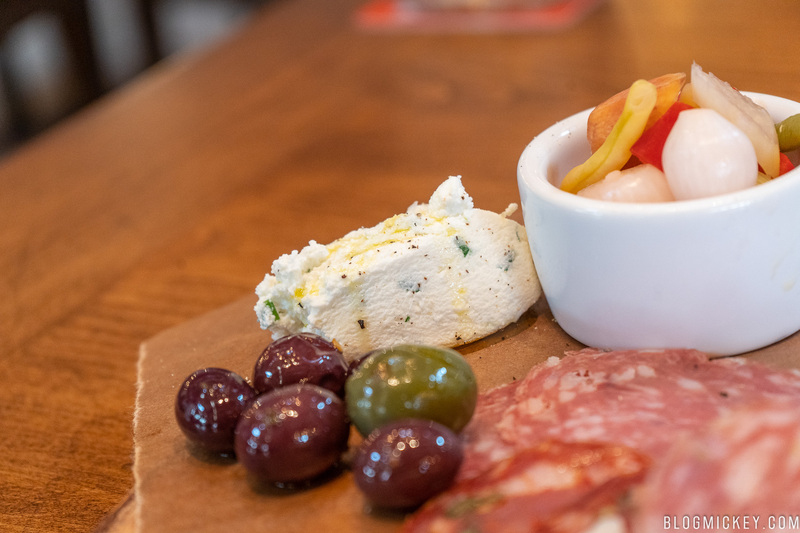 If your party isn’t able to decide on a specific flavor that they want to enjoy, Wolfgang Puck Bar and Grill does a very good job of delivering flavorful dishes on a variety of offerings. 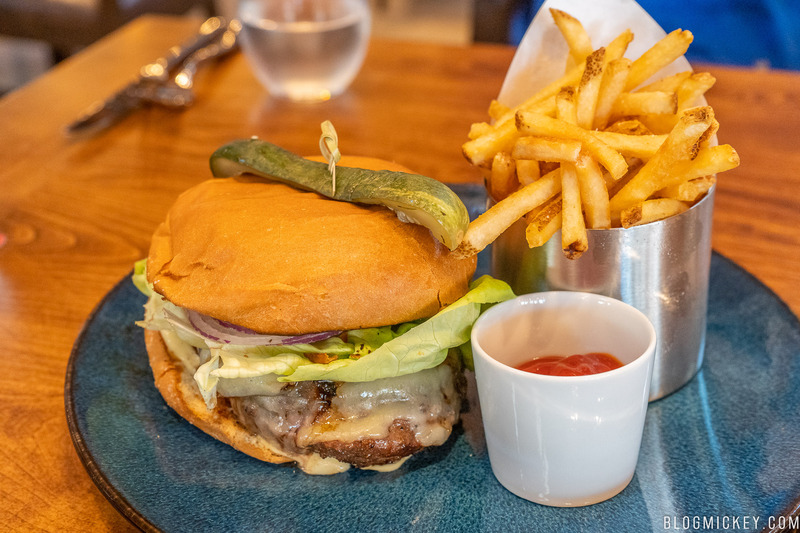 There is something for just about everyone at Wolfgang Puck Bar and Grill and we’ll certainly be back to enjoy some of the dishes from this review as well as some new offerings! We have been to wolfgang pucks many time before the remodel. Very good food never had a complaint. Went to wolfgang pucks after the remodel and will never go again. Limited menu prices to high. My father in law got sick off of the snapper. We have been pass holders for almost 20 years. One thing I have noticed over the past few years. Disney is more concerned about money than they are about providing a good experience for the price you pay for things there. I think instead of spending time trying to remodel everything try getting back to making sure the people that come there year in and year out are taken care of. Customer service has taken a big dip at Disney. Yes Disney will always be around with me or without but you’ve got to get back to making the customer happy and stop raising prices. Most people can’t afford Disney anymore. Walt said he wanted to create a place for affordable family fun. Now people have to save for years just for a family of 4 to spend a week there. Wakeup before it’s to late.